The MA programmes in Creative Writing and English, University of Limerick, are pleased to announce the launch of the 2018 issue of The Ogham Stone. The journal publishes new prose and poetry by Irish and international writers, and the 2018 issue includes contributions by UL writer-in-residence Martin Dyar as well as Faye Boland, Jo Burns, Patrick Deeley, Eoin Devereux, Clare O’Reilly and Breda Spaight, among others. The Ogham Stone will be launched on Thursday 3rd May at 5.15pm in the Millstream Common Room, UL. The event will feature readings by contributors; refreshments will be served, and copies of the journal will be on sale on the evening. Members of the public are welcome to attend. The launch will take place as part of the UL Frank McCourt Literary Festival & Creative Writing Summer School, details of which may be found here: https://www.ul.ie/artsoc/content/ulfrank-mccourt-creative-writing-summer-school. The event welcomes Marian Keyes, Kevin Barry, Sir Bob Geldof and others to UL. 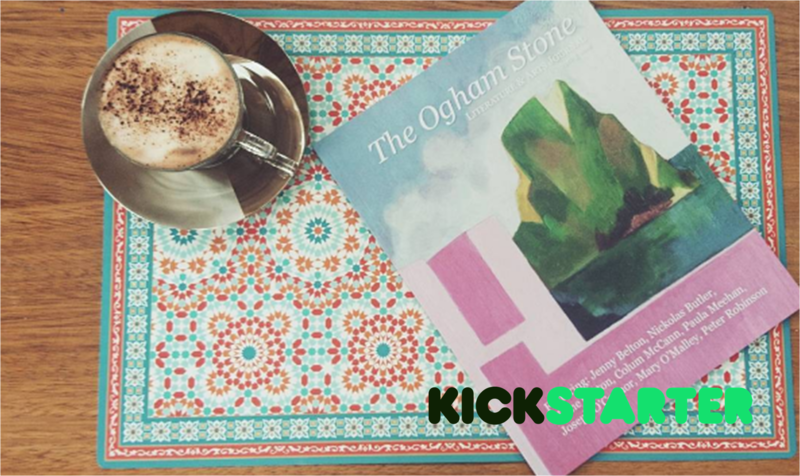 The Ogham Stone Kickstarter is now live . Kickstarter is the world’s largest funding platform for creative projects. It was planned with the intention of overcoming budgetary constraints and enabling us to enhance the quality and quantity of the magazine and make it available to a greater reader-base. We also hope that the funds will assist us in planning a better launch for the production. The current goal is to raise €1500 in support of the project over a thirty day countdown. Interested individuals may opt for the following levels, namely, Moonstone, Obsidian, Quartz, Sapphire, Ruby, Pearl and Diamond. These levels come with gradually increasing monetary pledges and attractive benefits. The estimated delivery of the journal is spring, 2018 and it ships all over the world. We are thankful to our Kickstarter team members Oonagh Fox and Jordan Kubichek who collaborated with Christian Tan of Digital Media, UL to get the Kickstarter up. This, without a doubt, has been possible only through Dr. Carrie Griffin’s constant support and guidance. We would kindly urge you to lend your support to our project and look out for the journal in your local stores or online. It is a strong coincidence that on the morning of Peter Robinson’s poetry reading at Limerick City Library, his poem “Night Flight” was published in The Irish Times. “Night Flight” explores the concept of home, which is a common motif throughout Robinson’s poems. In addition to reading “Night Flight,” Robinson also shared poems from Collected Poems, which was published in 2016, and from Ravishing Europa, an unpublished exploration of Brexit. Following the reading, Robinson had a generous question and answer session, in which he shared many pearls of wisdom from “make [writing] up as you go along” to “you make discoveries about yourself when you write in your own language rather than inventing things.” One of his closing remarks, “to take yourself seriously as a writer,” is advice we at The Ogham Stone look forward to guarding and following in the years to come. 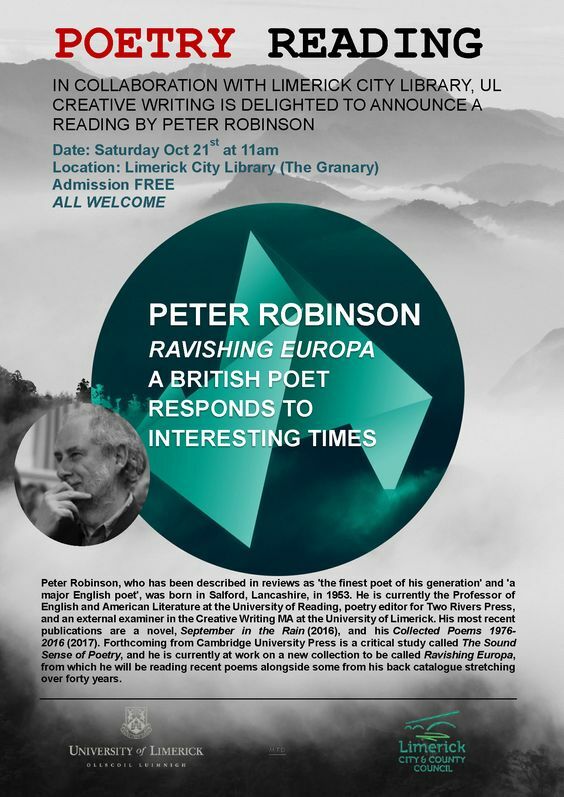 In collaboration with Limerick City Library, UL Creative Writing is delighted to announce a poetry reading with Peter Robinson on the 21st of October, 11 am. Robinson is a known for both his poetry and prose and is also a critic, translator and editor. His most recent works include: An Epithalamium (Pine Wave Press: 2016) and Collected Poems 1976-2016 (Shearsman Books: 2017) 978-1-84861-524-3. The reading will feature poems from his recent work Ravishing Europa. He will also be reading from his previous works, spanning over four decades. Admission to this event is free of cost and we would love to see you there with friends and dear ones. As promised, we are back with a series of interviews with the members of The Ogham Stone team. Enjoy the spread and please watch this space next week for more! What are your reasons for doing this MA? I enrolled into this MA for improving my level of English and studying literature for my own work. How do you feel about doing the Ogham Stone Project? It is a little difficult for me, as a foreigner, but I feel comfortable because the members of our team take care of me very considerately. I know it’s early days, but do you have a favourite bit of this project? What is it, and why do you like it? I like to share the highlights of some poems with my teammates. They told me some unique meanings of words only suitable for the very situation mentioned in the poem. I hope I can know what a real Irish magazine is like. In China, magazines are not popular any more. My favourite bit is the way we can, as a team, influence the shape of the Ogham Stone, but literally (as in design decisions) and metaphorically. The Ogham Stone is in its early days and so we are on the ground floor of creating something that promises to be very exciting. I hope that we can do a good job, that is professional and business-like but which also contributes to the cultural landscape of Ireland, and of creative writing, in even a small way. What skills and interests are you hoping to bring to this project? I have some experience in organising websites and a small business, so I think that’s the place I’m best located in. I love writing and have been studying it for the past four years. I see this as a chance to grow my portfolio and meet successful authors. I’m excited to have a chance to put my name to something that will appear in print and to help others achieve the same. I’ve loved reading all of the entries and experiences the diverse voices and styles of the authors. That we’ll create something that will endure and give a platform to some very talented writers. My experience in fiction writing and love of the short story. I just decided it was time I make writing my priority for the year. The MA program is a wonderful opportunity to do that. I think it’s a wonderful, chaotic idea. We will create something together we can be proud of. It can be a humbling experience to see how much work goes into something like this and the range of talent that is out there. And writers can always use a bit of humbling. The magazine is a space for us to see the ‘other side’ of the process. You see how many submissions we get. Now you can understand why publishers and agents can’t take on everyone. So many people have a voice. So many want to be heard and we just can’t publish them all. That it’s gets published with everyone still alive. I already have a literary magazine called Silver Apples. I’m quite enjoying having so many people to chat to about this project. I just want to produced the best quality magazine we can and more importantly ENJOY doing it. I’ve spent a good part of the past few years writing and performing across various stages, but I’ve also edited books of poetry, fiction and non-fiction. I’m currently in the poetry committee with partial responsibility for what will eventually go in to the Ogham Stone, and in many ways it’s similar to my previous years spent judging various poetry competitions that I won’t name for fear of offending anybody who might have entered but didn’t win..
My favourite parts of the project so far are both the grit involved in putting it together, and the standard of entries we’ve had the privilege of reading. The volume of submissions was enormous, so to whittle it down hasn’t been easy, but between the lot of us it’s generated huge debate over what should make the grade and what shouldn’t, all the way down to what makes some poetry stand out from the crowd more than others. The conversation has been lively and informative, and I’m looking forward to seeing what the final poems are. My hope is that eventually we’ll manage to work our way through the massive amount of work we have ahead of us to put together a book that can stand the test of time. So much of modern living is fleeting and instant, so if we can capture something timeless and present it to the world I’d be delighted. So far I have enjoyed the team of readers in the Fiction / Memoir group and our ability to work well together. I hope the project will produce a quality literary journal that can be a satisfactory outcome for both the editors in the class and the writers and artists who bravely submitted their work. What are your experiences coming into the project? I contributed to the production of an online historical journal about the Irish immigrant experience in Australia last year. What is your favourite part about the Ogham Stone project? Quality over quantity is important in an exercise like this, and I don’t think people should be burdened with awkward responsibilities just because they have experience in that area. I’ve done public relations for different events, so I have experience in the area of Communications, but none for the actual journal itself! I’m really enjoying getting to see different perspectives from others in my group, and getting to see how a literary journal comes together. I hope that this experience will be equal parts enjoyable and successful for everyone involved in it, and that the launch nights will go well! My favourite part (only part) so far is reading the submissions. It’s fun to read other people’s stories. I hope the project wont rob me of too much sleep over the course of publication! On Thursday September 21st, Out in UL (UL’s LGBTQ+ society) held a poetry evening, ‘Louder Than Words’ in The Scholars Club on campus. Poetry evenings have become a staple in Limerick city recently, due to the rise in popularity of a monthly event for emerging writers called Stanzas. Stanzas aims to give a platform to those who are just starting to create prose and poetry, and gives them an opportunity to allow their writing to engage with the wider community. Out in UL saw the impact of this event and decided to try and engage the student population of UL even more with the joys of poetry. ‘Louder Than Words’ began with poetry readings by some members of the society, which included many original poems, that had a strong focus on the themes of identity and sexuality. After a short break, those in attendance were encouraged to take part in the open mic section of the night, where they could read any poetry that meant something to them. Several people decided to give it a go, many of whom had never read in public before, but all shared a love of words, be it their own or those of a poet they resonated with. ‘Louder Than Words’ was an intimate and thoroughly enjoyable event, which was a wonderful experience for those on either side of the microphone, and will hopefully become a regular event in UL! Working on The Ogham Stone entails more than just snorting caffeine or getting power adjustments for our spectacles. The team that comes from a diverse background, has a lot to offer in terms of experience and unique talents. Starting this weekend, we will be uploading interviews with our staff regularly. Enjoy today’s spread and watch out this space for more! 1) Why have you chosen the Creative Writing MA? I chose the Creative Writing MA because I’ve always been a writer. The charming anecdote I tell people is that I’ve been writing stories since I could hold a pencil. My hope for this program is to focus onmy craft and be able to refine my writing skills. I think the choice to require MA students to staff the Ogham Stone literary journal will help us all to understand the other side of submitting our work and the tough decisions involved when choosing pieces to include in the journal.